On February 6th, 2017, Children’s Miracle Network Hospitals account manager Kieriay Moyer and Our Lady of the Lake Children’s Hospital program director Danny Fields joined over 250 key stakeholders of United Networks of America to talk about who Children’s Miracle Network Hospitals is and how United Networks of America can build local relationships with hospital program directors across the country. 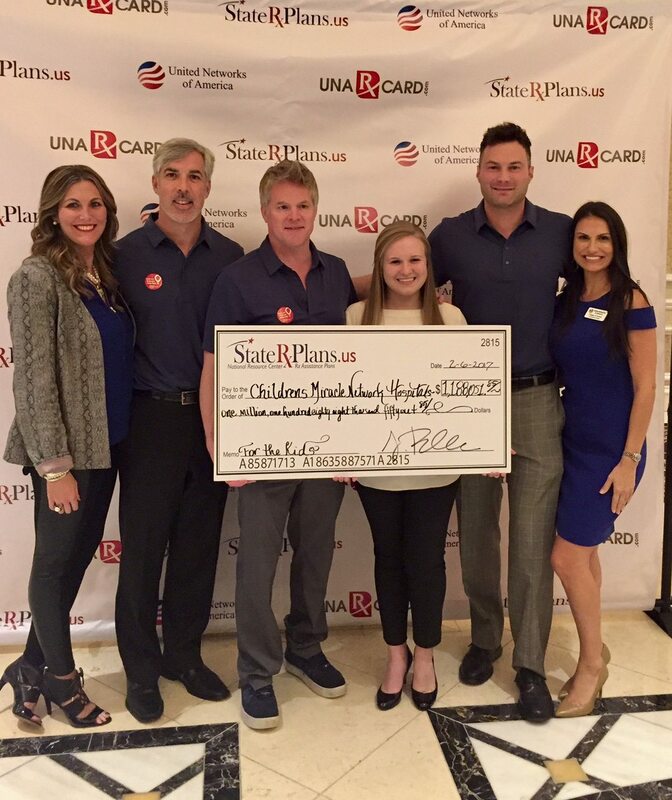 Program directors and representatives for every state Rx Card were encouraged to reach out to their local hospital, build a relationship and learn how Children’s Miracle Network Hospital funds support the children treated in their local community. After the conference, the United Networks of America team presented a check in recognition of the over $1 million that has been donated since the beginning of the partnership in December 2015. From L to R: Janay Giblin, Senior Vice President – Mid America Operations; Michael Perrault, Senior vice President – East Coast Operations; Ryan Jumonville, Founder and Chairman; Kieriay Moyer, Children’s Miracle Network Hospitals Manager – Activation; J. Brian Oliver, Chief Executive Officer; and Dana Crowe, Vice President – Media and Public Relations. When something seems too good to be true, I'm naturally skeptical. So when I got a press release for the new Illinois Rx card - a completely free card offering discounts on prescription drugs at 56,000 pharmacies nationwide, all I could think was "What's the catch?" The card is the brainchild of Ryan Jumonville, the 30-something, Louisiana-born president and CEO of United Networks America (UNA). Jumonville appeared at a press conference in the Illinois Capitol on Wednesday to promote the card, answering my plethora of probing questions that sought to discover whatever secret I assumed must be hidden in this deal. Apparently, there is no catch or secret. The card is completely free to anyone in Illinois, regardless of age, medical condition, income, insurance status, or pizza topping preference. I asked about pretty much every aspect I could think of, and (almost) all of the answers from Jumonville and his team were satisfactory. UNA doesn't collect any information about card users, Jumonville says, and the cards work for all generic and name-brand prescription medications, including the expensive ones for diseases like cancer and AIDS. There is no obligation or contract if you use the card, and it's not funded by any government money. It works through agreements with the pharmacies, who voluntarily offer discounts on prescription medicines to anyone presenting the Illinois Rx Card. Why would pharmacies agree to slash their prices? Jumonville says participating in the program is not so much about stealing customers from other pharmacies, but rather about generating entirely new customers - getting people who normally can't afford prescription medications to actually come buy them. He says the model has been proven in neighboring states like Indiana and Missouri. The only question I have left is how UNA makes money from this deal. It's obviously a business venture for them, as evidenced by this 2005 story in Business Report magazine about Jumonville's plan rolling out in other states. (Warning: PDF file) The article says in the case of Arizona's program, UNA makes its money from a $1.80 fee paid each time the card is used. Because the card is free to the end user, I assume it must be the pharmacies paying the fee, though I'm not sure if the same arrangement exists in Illinois' version. UNA features the article on its "About Us" page here. When I asked Jumonville about how the company profits, he essentially said it's not important. As much as I hate to admit it, he may be right. I've wracked my brain trying to figure out a way that UNA's mechanism for profiting from this venture affects the end user, but I simply haven't been able to come up with a single thing. So there you have it. I've tried my best to be a buzzkill, a role reporters often must fill, but the Illinois Rx Card seems to be legitimate. Get more info and decide for yourself at www.illinoisrxcard.com. One more thing I forgot to mention: The Illinois Rx Card team worked with the Greater Springfield Chamber of Commerce to get the project rolling, which should lend it some additional credibility. Another one more thing: Just to be crystal clear, this is not an endorsement of the Illinois Rx Card or any person, company or program associated with it. No one paid me to write this, and everything in this post is true to the best of my knowledge. Did you know that being a Nevada resident gives you access to a FREE discount prescription drug card? The Nevada Drug Card, available through the Chamber's website, LVChamber. com, can give any Nevadan access to significant savings on prescription drugs. The Nevada Drug Card is particularly beneficial to those without health care coverage or a prescription drug benefit. All Nevadans, even if you have insurance coverage. This program is already used by individuals who have Health Savings Accounts, high deductible plans and Medicare Part D for non-covered drugs. There are no enrollment forms, no age or income restrictions, no exclusions and no annual limits on this program's use. Nevada Drug Card utilizes "lowest price logic" to guarantee that you pay the lowest price on your prescriptions. You simply pay the lower of a discount off the Average Wholesale Price (AWP), a discount calculated off MAC Pricing or the Pharmacy Promotional/Retail price. This card is preactivated and can be used immediately. For more information, and to download your cards, visit LVChamber.com.